Time, temp & direction...finger tips! 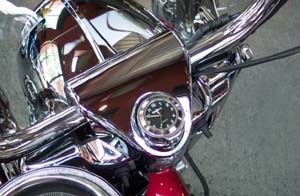 VT-85: Chrome billet handlebar clock assembly. Fits: All models with 7/8" or 1" handlebars. 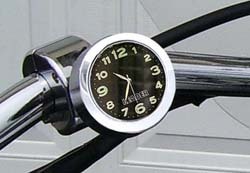 VT-88: Handlebar clock assembly with a silver and black face and glow in the dark hands including rubber lining. Fits 7/8" and 1" handlebars. 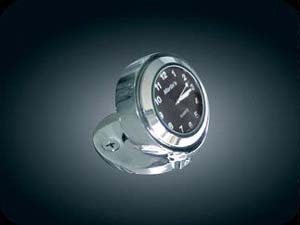 6028, 6029, 6030: Handlebr Mount Clocks and Thermometers: Ever wonder what if you are going to make it there on time but can’t check your watch because it is covered by your gloves or jacket? 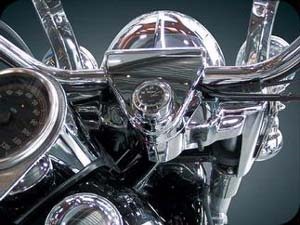 Or you are riding in the fall and wonder how close the temperature is to causing icing problems on the road? Solve that dilemma with a clock or thermometer. Choose either Electroliminescent or black to compliment your existing gauges. 6042: Same as above but with thermometer. 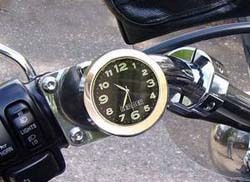 EMC-HDB, EMC-HDW: This motorcycle clock easily mounts to all Harley-Davidson handlebar controls (screw spacing 1.5"). FITS BOTH LEFT- AND RIGHT-SIDE CONTROLS! Unlimited Positioning Options! Faceted lug slides into mounting bracket at SIX different angles. Unique piston design allows for 90-degree angle-ability(left-right or up/down). 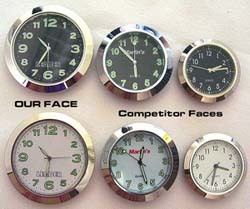 Clock can be pressed in at ANY angle. THE BIGGEST FACE! (You sure can see this baby when you’re riding!) 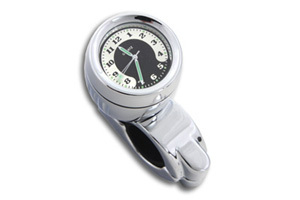 If you've ever had to squint at a watch or other clock while riding - this is for you!Large face and large numbers make it easier to read. Water resistant, Shock resistant (great for that bike that vibrates or goes FAST) Luminescent hands and numbers for viewing at night. Just simple, chrome, made-in-the-USA beauty. 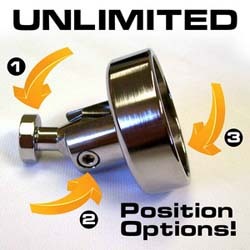 Nearly unlimited mounting capability! EMC-HBB, EMC-HBW: Same as above but for handlebar mount...select diameter. CP-1B, CP-1W: A simple but straight forward accessory. 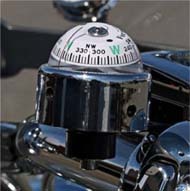 The 360 Moto Compass can be calibrated, meaning any interference from the bike (radios, etc.) can be compensated for directly on the compass for the most accurate readings ever. 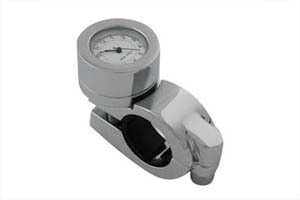 Use the aircraft type adjusters on the bottom of the compass to accurately compensate the compass against false readings from metal areas and/or adjacent magnetic fields. Compensators have been set at the factory to the neutral position and may be perfectly calibrated right out of the box. 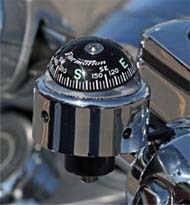 Solid brass and stainless steel construction, a carefully designed compass ball housing combine to give years of service and eliminate possibility of compass oil fluid leaking from the housing. 42mm (1.65") Diameter Chrome Base. 35mm (1.37") Compass Ball. 38mm (1.49") Height. Comes complete with L-bracket. 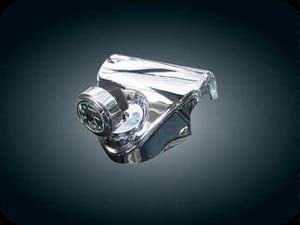 Secure the notched end of the L bracket to a 1/4 inch screw or bolt on the vehicle with the large opening of the bracket on top, ideally a windshield acorn bolt or switch housing screw or add our Handlebar P-clamp CP-P. Larger face is easier to read while riding!